Wow, it's Wednesday already. Here are a few midweek odds and ends. One half of the new food stands in the Mitsuwa Marketplace has revealed itself. The Missus had a hankering for Una-Don, so I purchased some Unagi from Nijiya, but decided to make my own quick and dirty Nitsume(Eel sauce). We've purchased the bottled stuff, and found it either to be too salty, or too sweet, or having strange flavors. So I decided to try a slight modification of an interesting recipe I found in DK Kodama's Sushi Chronicles from Hawaii , which I purchased on my visit to Sansei a few weeks back. The recipe is pretty easy, and after seeing the amount of Sake in it I had my doubts, but it turned out to be quite good. Maybe a tad on the sweet side, but not bad at all. The recipe uses some short cuts, like hondashi...which worked out well, since I didn't happen to have a whole bunch of Eel trimmings lying around. The recipe also calls for the Hondashi to be boiled...which made it a fishy-bitter during the first pass, so I cut the amount in half, and added it right before the reduction process, and it worked. I'd been taught never to boil anything after adding Hondashi, but in this case it worked during the low boil. Purists may just want to skip the recipe, if it hurts too much. 1 - Mix all ingredients except Hondashi in a pot. Bring to a boil stirring to dissolve the sugar. Reduce heat to medium-low and add Hondashi. 2 - Reduce mixture by half to a light syrup. 3 - Store in a tightly sealed container and refrigerate. According to the original recipe this will keep for up to 1 month. Have you ever known anyone who craved brussel sprouts???? With Nitsume??? And Rice??? One last item - mmm-yoso's very own Cathy Doe has been recovering from illness, so I'd like to make sure to tell Her to hang in there, and get well soon. She's still posting too..what a trooper! mmm, that una-don looks good!!! and to cathy...get well soon!!! I've never in my life had brussel sprouts. Do they taste like they look? Tiny cabbages? Your skills in the kitchen never fails to amaze me. 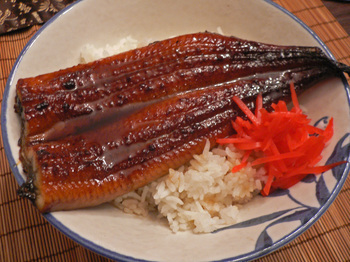 Making unagi from scratch is something I wouldn't even think of doing, much less attempt! Hi Pam, and everyone who has sent me get well wishes...I guess I can play a guessing game with all of you, too. 2. The medicine I got will do absolutely nothing to make me better any faster. 3. Basically, physics is involved. I love your posts about your wife's obsessions. I'm totally like that when I get a craving. oh! oh! is wandering chopsticks right, Cathy? if so, congrats!! I have a post almost done and will put an add on..by the weekend. Keep guessing. Hi Pam - So you crave brussel sprouts??? Hi Mizducky - Brussel sprouts are easy to cook...how can you mess them up? Hi Elmo - They do taste cabbage-y, they also have gotten a bad rap, and are not as bad as most people say. Hi WC - So you're relentless in feeding your obsessions! I admire the focus and determination. Hi Cathy - LOL! Something you haven't told us?? Just kidding! Right now I'm hungry but don't have any particular craving. That's even worse! I love Brussel sprouts. One of my favorite detox dishes is an oden made using Brussel sprouts and konnyaku. Hi WC - That is tragic...but I'm sure it'll be remedies soon! Hi CP - Brussel sprouts in Oden? That's a new one for me. I love brussels sprouts too! I like them the same way as Pam with shallots & pancetta. But my absolutely favorite way is to braise them in heavy cream with a pinch of nutmeg. 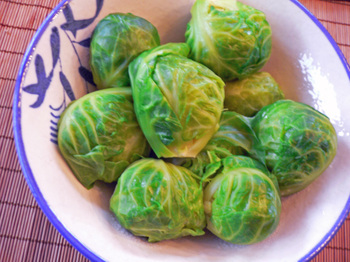 O O OOOO I adore brussels sprouts! Particularly at holiday meals. Unfortunately they are not an abundant creature around here and I have not had opportunity to plant any either! =o( I love some of the more creative cooking methods I see from other readers. My way is rather plain but it is fast and easy! Clean & trim 1 to 2 cups of sprouts, put in microwaveable dish with about 1 tablespoon of water and a smallish knob of butter. Cover tightly. Nuke for 6 minutes. I'm trying the saute though. Maybe for Thanksgiving if I can find some at a reasonable price! 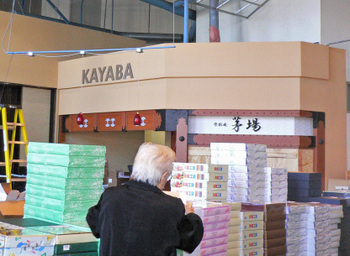 Kayaba now has a set of shelves displaying plastic versions of their dishes. I wonder if they had to order the plastic food from Japan; it was quite realistic. If my memory serves, I saw several katsu dishes, tempura, udon, ramen and various combinations. maybe i'm cooking them wrong, but the sprouts always seem to have a slightly mushy texture, especially on the insides. Hey Kirk, writing this from Taiwan, just in the mood for eel too. I'll email you when I get back.